JOSEP GAZ was born in Martorell the year 1656 to a family of craftsmen. He began his musical studies with a church choir in Barcelona, obtaining the post of Chapel Master in Mataró at the early age of 19. He was later to move on to Sta. Maria del Mar in Barcelona and remained there until he passed the eliminatory exams in Girona in 1690, where he spent the rest of his life. In 1711 he retired as Chapel Master owing to excruciating pains caused by gout. He then occupied the post of tenor in the same chapel until his death in 1713. The music chapel of Girona cathedral at that time was composed of about 20 members, four of whom were choir boys devoted to the high-pitched singing. Due to the wide variety of liturgical necessities it was advisable to have a fixed core of singers and instrumentalists to which other voices or instrumentalists were added according to the complexity of the composition. This variable structure allowed the Chapel Master more freedom enabling him to compose not only short format pieces of solo and basso continuo structure, suitable for the liturgical needs of local guilds and corporations but also longer, orchestral pieces for important festivities and royal visits. Up to the present there have been few studies of Gaz's work in spite of the high standard of his compositions. No portrait of him has been preserved but thanks to certain clues we can imagine him as a small man of round build, very hard-working, methodical, eloquent and extremely imaginative. His education must have been broad yet solid, to judge by the samples we can see both in the texts that he uses in his works and in the high quality and originality of his musical compositions. In the former, the language used is Castillian Spanish while Catalan remains marginal, only appearing in certain carols where it is spoken by peasants and shepherds and lower class people. The texts of these compositions can be considered as part of the Spanish conceptista trend with a culteranismo influence in the formal structure. This may well derive from the stylistic influence of Calderón de la Barca, whose work he must have been familiar with since part of a musical adaptation of his morality play Afectos de Odio y Amor (Feelings of Love and Hate) has been preserved. The metrical art of these texts is very free, although rhyme is often used despite sounding forced. He also uses quite a large variety of rhetorical figures that make the texts dificult to understand. force its power and its presence by means of new forms of popular devotion, and by a new impulse of religious music, as well as the creating of new convents with new religious orders in the city. reason, was to become one of the new paths of religious experience. Gaz would often follow this path using the language of the Spanish mystics. Moreover, the role of craftsmen must not be forgotten in this context: those who built the new instruments of scientific observation, the basis of this revolution, were equally as important as those who invented the new Baroque musical instruments without which Baroque music would have been impossible. Gaz's musical style is a blending of Spanish courtly music, harsh, austere, and the new Italian style, softer and more playful that came in via the port of Barcelona and which included the use of new musical instruments -violins and violon- cellos- thus paving the way for new forms of sonority to accompany the primitive basso continuo and creating greater musical prominence with more splendour of sound. His style is of great versatility with very elaborate and varied melodies. La Concepción de Maria, (The Conception of the Virgin Mary) where he juxtaposes passages in the old style with others that are totally bourgeois is possibly the best example. Similarly, some of his villancicos are really primitive cantatas where a recitation and at times, arias, have been added to the chorus and the traditional compositions. Gaz was one of the promoters of the use of violins in Girona, giving them a definitive impulse. 1. Oy que Gerona a Maria (Today as Gerona [praises] the Virgin Mary) (1710): the archduke Charles of Austria, pretender to the Spanish throne in the War of Succesion (1702-1713) between the House of Austria and the Bourbons, visited Girona in January 1710, after the city had decided to go over to the Austrian side in 1705 due to pressure from Barcelona. In the face of this situation the bishop of the city, Joan Miquel Taverner, a well-known loyal to the Bourbons, emigrated to Perpignan and lived there under the protection and patronage of Louis XIV. This cathedral reception in honour of the Austrian pretender was majestic, with popular festivities and formal receptions. This solemn villancico corresponds to the archduke's visit to the cathedral where several masses were celebrated at the same time with the pretender attending the main one. A lengthy composition, with a profusion of voices and instruments which explains his rights of inheritance to the Spanish throne in a popular way. According to the author, these rights were confirmed by a series of wonders that prove he is the one the heavens favour to be the king of Spain. clearly expresses the fear caused by the bishop's return and the French military presence among the Girona clergy. We can see this in the words "siendo butifleros aquí cantaremos" (although we are loyal to the Bourbons, we will sing here) to seek the favour of an authoritarian bishop who had persecuted his own priests, most of whom sided with the House of Austria. The contrast between this piece and the previous one is the only known element that allows us to form an opinion about Gaz's political inclinations. 3. Del glovo celeste (From the heavenly globe): this is a villancico in cantata form for a soprano with violins and basso continuo. It was composed for the inauguration of the altarpiece depicting the Immaculate Conception, situated on the left of the main entrance to the cathedral. This altarpiece reinforces the medieval Girona tradition referring to the Virgin Mary's conception. It was done by the sculptor Pau Costa and paid for by the canon Cristòfol Rich. The latter was very close to the Jesuits and decided the pictorial content of the altarpiece: the top part was dedicated to Saint Christopher, the centre to the Immaculate Conception, and the bottom part to the death of St. Francesc Xavier (1506-1552). This Jesuit saint and missionary in Japan, died in a cave near Macau when he was waiting for authorization to enter China. It is a solemn composition in which bourgeois elements coming from Italy are found alongside courtly, old style Castilian elements, which endow the whole with a decidedly dramatic character. This duality is also reflected in part of the composition where the emaciated saint's corpse contrasts with the plump cherubs around the cave, the sailing boats and the island in the background, that represent the sea of south China. 4. Corazón afligido (Troubled heart): it is in reality a cantata solo following Italian models where narrative and reflective elements are combined - arioso, recitation, aria, recitation, aria da capo, recitation and aria - each one of them corresponding to different rhythms and the distinct internal structural elements. The melody is very elaborate so that it can be appreciated and assimilated by the congregation as their activity during mass was totally passive at that time. It was initially dedicated to Saint Theresa whose name was soon erased, possibly after the author's death so that it could be sung on other religious occasions. 5. La Concepción de Maria (The conception of the Virgin Mary): this is one of the composer's most elaborate pieces. It is about a subject he had already dealt with when he was younger and due to the great success it enjoyed, must have been very dear to him. It is a villancico with the typical chorus and couplets to which are added other elements of Italian origin such as the opening and fugue at the beginning, the recitation, the aria and a choir without the repetition of the initial chorus. It is interesting to notice the baroque symbolism of the musical scale that goes from low to high notes as if it were a path that communicates earth with heaven. The dialogue between the instruments and the voices is characteristic of the new, in-coming 18th century style. The lyrics compare celestial harmony where God is in charge, with that of earth destroyed by Adam with his sin (disonancia) and put right by the Virgin Mary with her consonancia (harmony). We do not know for which occasion it was composed, possibly for a festivity dedicated to the Virgin that was celebrated in the cathedral. This subject was not only dear to Gaz, but was also very prominent in the history of Girona, both in its liturgy and art as well as among the city governors. In 1394 king Joan I (1350-96) ordered the authorities of Girona to celebrate this feast day every year and to punish all those who, like the Dominicans, preached against it. there are still some ironmongers in this street. The basilica of Saint Felix, where this piece was sung, has a chapel dedicated to Saint Anne. It is not easy to establish the connection between this saint and the treaty of Perpetual Peace; in January 1698 the French troops left the city after occupying it for four years, following the Ryswick agreement. When the troops of Charles II from Madrid arrived in Girona, a Te Deum was sung in the cathedral. There is no record of it being composed by Gaz, however. It would be sung in Gregorian chant. The reason for him composing this piece may be that he was encouraged to do it by the requests of neighbours from les Ballesteries who were tired of the French occupation of Girona. It is quite unclear, however, why it was sung on Saturday, August 9th 1698. 7. Al Juego del Hombre, Fabio (A game of cards): a very strange and enigmatic composition dedicated to a Spanish card game that the author uses with a moralizing intention according to an old tradition. It is one of the few profane compositions by Gaz that has been preserved. We do not know where and when it was sung, but the use of a limited amount of musical resources would suggest a cultured, domestic setting. The lyrics refer to the first card game known in Catalonia and Castille: it was called "El Juego del Hombre" (Men's game), because of the main player. The name Fabio was a common way to refer to a cautious man. The first chorus warns men that to fool with women is always dangerous. This danger is shown in the couplets through the card game using the four suits of the traditional Spanish deck: bastos (clubs), oros (gold coins), copas (goblets) and espadas (swords). Thus, women's eyes are swords that penetrate the hardest of hearts; the goblets, carried in their refined hands, are equally seductive; the gold coins represent their hair that men love to contemplate, etc. 8. Xácara, xacarilla de gusto (song based on a satirical ballad): this composition dates from the composer's youth, probably from the time when he was Chapel master in Mataró, although we do not know the circumstances in which it was composed. It is based on Castilian ballads of the same name that were Islamic in origin, of a satirical nature and often used rude language. These ballads were used in the entr'actes of classic Castilian comedies in the 17th century, at times accompanied by music, "la xacarandina", or by dancing. Its popular tone can be seen not only in the vocabulary, but also in the repetitive rhythm. This kind of composition must have shocked the congregation of Mataró not only because it is exotic but also because Gaz dared to apply this kind of music to praise the privilege of the Immaculate Conception of the Virgin. MÚSICA ANTIGA DE GIRONA is an association dedicated to promulgating the musical works of the cathedral chapel that are housed in the chapter archive. 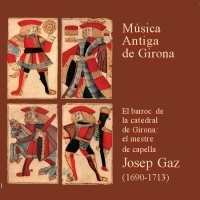 It has digitalized scores written by 18th century Girona chapel masters and presents them in concerts and also in CD editions.